Home Entertainment Can Anthem combine co-op multiplayer and story? Anthem is looking good – real good. EA’s Bioware creative executives recently took to the stage at a panel at Pax West, where they revealed a new trailer (above) and discussed the game and where it’s going. 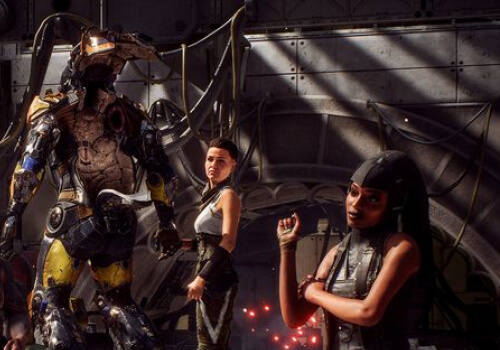 The developers explained that Anthem has been designed in two parts for two types of gamers, ‘Our world’ for those that want the full multiplayer co-op experience filled with action, and ‘my story’ for anyone that wants the deep story and connections that Bioware is known for. The two are seamlessly connected for the individual player, but each player can experience a different ‘my story’ depending on their interactions with NPCs at the home base, Fort Tarsis, and the lore they discover on missions. We already knew that the player is part of a freelancer group, but the developers have now said that the group will be "like a soft family." The team is comprised of you, a freelancer who defends Fort Tarsis; Owen, your main cipher; Fay, a secondary but much more powerful cipher; and Halak, who is a retired legendary freelancer. He’s a mentor and a friend who’ll teach you skills as you learn about his past glory. As ciphers, Owen and Fay are psychics that will guide you on your missions and warn you of incoming threats. They both have their own intriguing pasts you can discover. As your home base, Fort Tarsis will offer upgrades, missions and unique interactions with the characters within. According to the developers, you can "have conversations that are deep and engaging" and "you’ll get to know the characters of Fort Tarsis intimately." Story not your thing? You won’t need to go through role-play conversations in order to get to mission content, say the developers – they were adamant you can jump straight into the action should you prefer. They didn’t spend much time discussing the action - we’ve already seen plenty from other trailers - but they reiterated that there’s lots to enjoy either solo or with friends, either as part of missions or exploring. It’ll be interesting to see how well this mixed approach pays off. Anthem is set for release on February 22, 2019 for Xbox, PlayStation and PC.